The idea for this project formed during my time on a music fellowship programme in the Model Niland gallery in Sligo so it felt like a fitting start point to gather sounds from the gallery as a starting point. My motivation for doing this project is to explore unconventional ways for musicians and sound artists to respond to each others ideas. The gallery building is a beautiful old school built in 1862 and has a wonderful heavy cosy structure with wooden floors throughout so a sonic portrait or homage seemed like the way forward. During my time in the gallery I had access to a resident studio and could also explore the building alone in the evening times which was when I set about collecting sounds from the gallery in winter 2007. I had planned to first of all focus on sounds that would be most recognisable to the gallery staff. The sounds of everyday working life in the gallery. I suppose my aim here was to build on an already established relationship with these familiar sounds. So I focused on sampling the various doors that are pushed open all day long with that familiar 'squeel' followed by a firm 'shclock' noise as it closes of its own accord. I then moved up to the gallery rooms on the second floor which have wonderful creaking floor boards and sampled my footsteps in a few of the different rooms. I then walked down to the main cafe area and was drawn to the sounds of the fridge from the cafe humming and buzzing with multiple layers of vibrating tones only noticeable when frozen to the spot with ones full attention. I was then pleased to find the resident grand piano on its side against a wall with its beautiful innner tapestry of strings and bolts exposed so I got busy gathering material from that. Some of the sounds I ended up using were plucked strings also bolts moving and clanking which found their way into the third guitar led part of the piece. The final piece ended up being a kind of triptych linked together by the sounds of my footsteps around the gallery. The first patterned part of the piece features the tinkling sounds of a small metal chain being trailed across the inner strings of the grand piano placed over a loop segment of footsteps on the wooden gallery floors. The second passage adopts a similar approach, this time featuring the more prominent sounds of plucked piano strings over different looping footsteps which then trails into sounds from the buzzing fridge from the cafe. For the third passage in the piece I took a dictaphone recording of a guitar piece I had written around that time with my year in Sligo in mind and played it over the looped sound of one of the main doors in the gallery swinging open and closing. 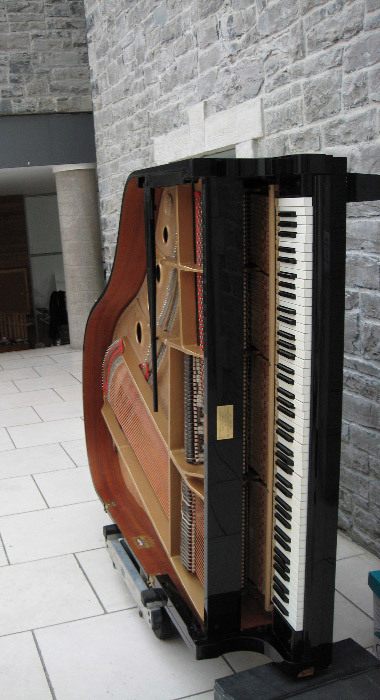 Mechanical clicking noises made from flicking small levers inside the piano feature here too. I then gathered together what I considered to be the most interesting moments from the piece and isolated the sounds and set them aside for the next relay candidate to respond to in whatever way they saw fit. Be it a literal link, where some of the audio may feature or wether the link was purely conceptual would be entirely up to them. Chequerboard is the recording name of Irish musician & artist John Lambert who blends classically tinged acoustic guitar with glitchy electronica. Chequerboard’s debut album ‘Gothica’ was released in 2002 followed by the mini album ‘Dictaphone Showreels’ on Lazybird in 2005 andhis second album ‘Penny Black’ on Lazybird in 2008.